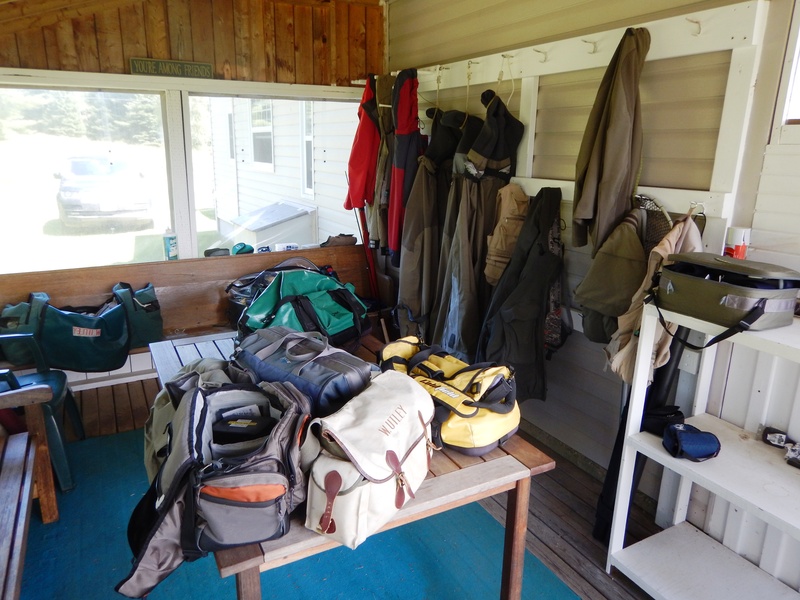 Fishing Friends – just back from 10 days on the Miramichi, and to be frank the fishing was very poor. We only hooked a couple of grilse for the whole period, and I heard that the other camps from Boiestown on down were also struggling. I have to believe that the chief culprit was water temperature. Late June was relatively cool, and it appeared from forecasts that the good conditions would continue, but they didn’t. The days weren’t terribly hot like the ones in the mid-30Cs that killed all the fish back in 2010, but as one example on Sunday 7/9 the Environment Canada forecast that the high air temperature for Doaktown on the coming Tuesday 7/11 – two days away – would be 22C with showers, and a low of around 9C. The next day the forecast changed to 28C with brilliant sunshine and then a low of 13C. All this last week was a string of days that had comparable temperatures to that, and each one with bright sunny afternoons. The result was that the water usually started the morning at 20C or warmer and ended it in the 23 to 25C range. The experienced wisdom of my old Miramichi mentor Willy Bacso was that 72F or 22C is the magic number. You can occasionally catch salmon up to that temp, but after that it takes an act of god. We reached 72F before noon virtually every day this last week, and that consistent occurence is another thing to consider. A quick check of my log book shows that about 1% of the salmon that we have caught on the Miramichi came from water temperatures of warmer than 70F. Each of the even fewer days when we caught fish at 22c/72F produced only a single fish, and none were caught in the succeeding days until there was a decent rain and solid cool-down period. These catches occurred when good water temperatures – and good fishing – were being replaced by higher temps. We were just lucky to get any fish in the warming water, and the bite quite soon came to an end. We ended up fishing only mornings all this past week, and breaking the alcohol budget by starting cocktails at 4:30. It was great comradery, but we’d rather have been salmon fishing. It is, of course, too early to decide if the run will be weak this year, or if what is supposed to be the peak of the mid-summer run has been pushed back by the warm conditions. We heard credible reports that lots of salmon are jumping out in Miramichi Bay, and we had one morning of good fish sightings just before it turned hot. We also saw groups of salmon running up the river on the surface right at dusk– apparently with no desire to stop in any pool until they got to a large supply of cool water. This was a nightly occurrence, and seems to show that when the river gets warm enough the fish are only willing to run the river in very low light, and without stopping until they get well up river where waters are cooler. Hopefully all will be well as soon as we get a nice raise of cool water. The immediate question is when will that raise happen, and will it be followed by suitable temperatures to catch fish? Right now it is forecast to be quite warm – high 20s – through around Thursday July 20 before returning to slightly below normal temperatures for the balance of the 14 day trend. This forecast is one indicator, but a week out is long enough that I wouldn’t want to plan on it. Certainly the forecast was wrong when it came to the week just past. DFO updates the counting trap numbers on the 15th of each month and then again on the last day. The link to what they call Cumulate Counts is on the Information Links page of this website selectable from the menu bar at the top of this page. The numbers for the traps on both the NW and Main SW branches of the Miramichi through June 30 are pretty much in line with longer term averages for the period. It is important to realize that while the statistic is highly variable in most years only something like 4% of the year’s run of both salmon and grilse arrive at the traps before July 1. As grand as these silver bullets are the numbers of June fish are just a tiny portion of the total annual run. Also, the numbers of June arrivals don’t appear to be much of an indicator of how strong the final counts will eventually be. In fact an examination of the numbers doesn’t seem to reveal any relationship at all, with good annual counts following poor early runs just as often as not. None-the-less you can’t help but feel a little reassured when the numbers to date are at least within historical averages. The parr don’t seem to mind the warm water, and while it is simply anecdotal the group of annual regulars fishing at my camp thought that we had good parr numbers showing all up and down our stretch of the river. During the sunny evenings the constant flashes from their surface feeding in the gravel shallows across the river from my camp were pleasant to watch. Striped bass are still a subject of concern along the Miramichi, and there are reports of schools being present at choke points here and there well up into the river. Bass are designed to lay in wait at choke points, and any parr trying to pass through will be in serious trouble. These upriver bass represent absolutely nothing in the overall striper population, but they are have to be very destructive up in the salmon nursery areas. There should be no size or bag limit on stripers above the head of tide, and anglers should be free to fish them out of these places. We did catch our second striped bass of the season in the lower Cains on this trip, but it is only our second one of the year, and we have thrown zillions of casts. I welcome and appreciate your comments. Please contact me if you have any trouble with this feature. Once I have approved your first comment approval is automatic after that, so please speak up. If at any point you want to unsubscribe just send me an e-mail and say unsubscribe and I will take you off my blog alert list. You will have to flit to Gods Country ” Scotland ” This is where the action is. Aye, Pat! How is the fishing on the Thurso? Love these reports, keep them coming! Doug – I’m afraid that we need a good raise of cool water to change things now. Pretty much the same upriver in Boisetown. Water temps a little better. Six days by seven fisherman produced 3 grilse. Saw fair numbers of fish in the pools and there were fish crossing the bar every morning early. Fish not taking well notwithstanding some cool mornings and good temps. Same storey here Brad- We are lucky enough to have a couple of cooler pools and are picking up a salmon or two a day , but generally speaking a very slow year to date. Even more disturbing is the presence of stripers , not only in the Miramichi but in the Gaspe rivers too. Rain might help, maybe? Weather has been sunny and temps have been moderate[74-77F]in Western WA, I am looking forward to seeing my old friends and wetting a line in the Miramichi in September. Kal – we’ll look forward to seeing you “back East”! Hello Brad, just finished three days on the Braewater beat on the Spey-its actually 6 beats and nearest the sea on a great river . Party of five, all very experienced and we managed two fish. Plenty of fish showing and we tried 3verything legal.! Sunrays, Francis, Riffled hitch ,even a bomber .With your permission thought I might hijack your blog to report on an incident on the River which is a reminder of safety issues . Every year it seems the Spey claims a fisherman. It’s a fast river, with some challenging wading and sure enough three weeks ago one member of a party drowned. A youngish German fishing Lord March pool lost his footing and was swept away in front of his wife. Ghillie went after him in the boat but he was gone by the time they caught up with him. He was WEARING NO LIFEJACKET. ghillie is distraught , wife is a widow ,River is in shock once again . Bill – it is odd that so many stripers are up that far. It must be parr that they are targeting. 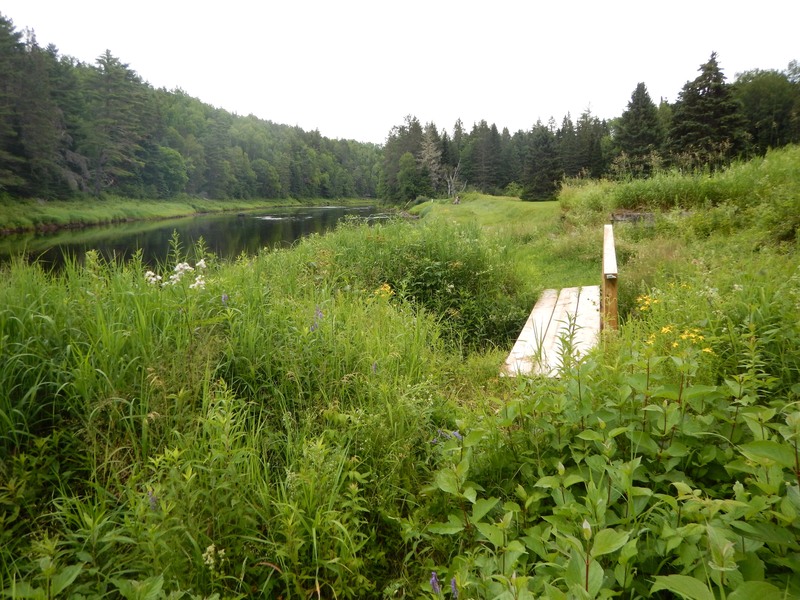 We have caught one at Campbell’s Pool in Blackville this spring – about 8 inches long – and one about 14 inches about a mile up into the Cains. That is about normal for us, and in fact is a couple less than we normally would get at Campbell’s. Read your post now Brad. Informative and enjoyable to read if not the high temperatures.